Join a 2-day hop-on hop-off double decker bus tour of Miami with hotel pick-up. Runs every hour and no need to walk to the nearest stop. Pick up from all hotels in South Beach, Miami Beach, North Beach, Bal Harbour, Sunny Isles and Downtown Miami. Simply call to schedule hotel pick-up. This open top bus tour sees all of Miami Beach, the Art Deco District, Downtown, the Financial District, Key Biscayne, Coconut Grove, Coral Gables, Little Havana, Bayside and Wyndwood Walls in Midtown in just 2 hours. The live narrated tour is provided by a knowledgeable and professional tour guide. Experience and see the great views and all Miami attractions from the open top, double-decker bus. With this Hop on Hop Off Miami 2-day pass, you'll have access to a bus tour through all of Miami, along with pickup and drop-off from all hotels in South Beach, Miami Beach, North Beach, Bal Harbour, Sunny Isles, and Downtown. After booking online you'll receive an email with tour supplier's contact details—simply give them a call to set up your hotel pickup. 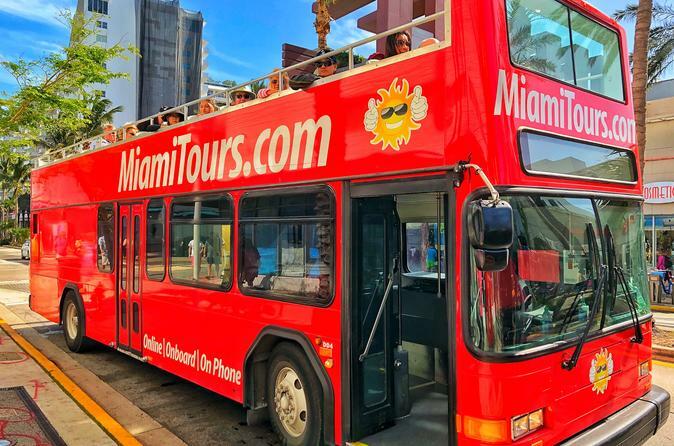 This open top bus tour includes all of Miami Beach, the Art Deco District, Downtown, the Financial District, Key Biscayne, Coconut Grove, Coral Gables, Little Havana, Bayside, and Wyndwood Walls in Midtown, a loop that takes just two hours. Hop off the bus as often as you want, choosing from top Miami attractions and hot spots, then finish the day with return transfer to your hotel (you'll also have the option to begin and end at the main terminal in South Beach).